It has been two weeks since Kerwin Bell accepted the offensive coordinator job at USF and left an uncertain future for the Blazers in the process. Valdosta State Football is in a unique situation but not an unfamiliar one. The Blazers have been operating without a head coach for two weeks officially but almost a month if you count when the reports of Kerwin Bell’s departure originated. Just three short years ago the program found themselves in a situation just like this. A coach that grew larger than the program chose to leave in search of a Division I stable. In that instance VSU was gifted with Bell, a University of Florida legend and a coach who had a “simple” goal in mind. In Bell’s introductory press conference he said he wanted to win a championship. Singular, not plural, and he achieved that goal. It could be said he superseded even his own expectations by delivering the only undefeated football season in school history. Bell walked into a program that was a contender and turned them into champions. Despite the doubt thrown his way during his first and second years he persevered. But VSU was never Bell’s end goal. He was never destined to become a long tenured coach for the Blazers. A credit should be given to Bell because he evolved the culture of the VSU football program. He took a team that was already known for their historic winning culture and created a would-be dynasty. Now the Blazers have a problem that almost any other program would be jealous to call their own. Valdosta is already nationally known as “TitleTown” and the defending national champions are returning the most dynamic offense in the nation. All that is needed is a coach that can guide this team on another national championship run. The Blazers would be lucky to find another Bell-esque style coach but the reality is that they won’t. Typically there aren’t coaches of his caliber openly available on the market, especially not this late in the recruiting period. Kerry Webb has been handling the current operations of VSU Football but with National Signing Day looming on Feb. 6, the program could face a devastating problem. Many future players won’t want to sign their future to a ship without a captain. 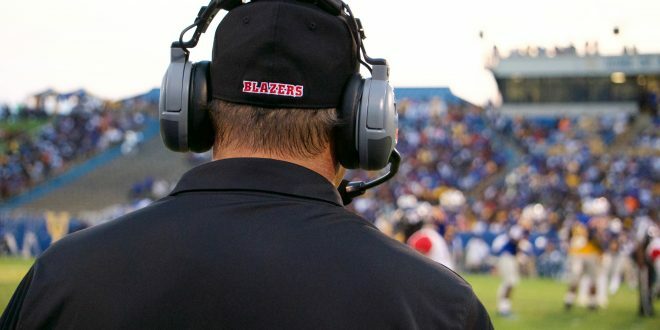 If Webb is offered the job the Blazers can piece together what’s left in the aftermath of Bell’s departure but if the job is outsourced the future is truly uncertain for Blazers football. Written by Juston Lewis, Editor-in-chief. Photo courtesy of Seth Willard, Multimedia Editor.